Shop and dine to your heart’s content at SM Megamall, and earn a chance to win Php 30,000 worth of prizes from select SM Megamall fashion, food and leisure brands. Get a raffle entry by simply enjoying your time at the mall! Use your Citi credit card or avail of 0% Citi PayLite for a minimum single-receipt purchase of Php 3,000 and double your chances of winning! 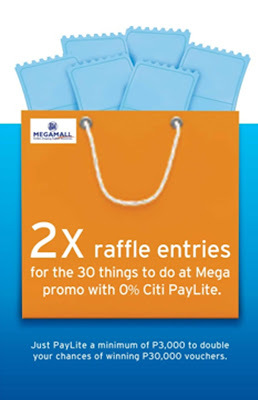 Existing Citi cardholders can simply register their purchases by visiting www.30THINGSTODOATMEGA.com to qualify and earn electronic raffle entries. No Citi credit card yet? Simply apply at the redemption booths located at the SM Supermarkets on Upper Ground Levels (UGL) Mega A & B; Lower Ground Level (LGL) Mega A; LGL Mega B near Ace Hardware; UGL Mega A Covered Walkway near McDonald’s; G/L Mega Fashion Hall near the Information booth; 3/L Mega Fashion Hall Parking Entrance near Uniqlo and 2/L Mega A (near Watsons). Entries can only be earned until October 15, 2017 while winners will be drawn on October 30, 2017. To know more, visit www.citibank.com.ph.